Stanley Barby shows off some of the best places to find prairie chickens on his ranch in the Oklahoma Panhandle. The silhouettes of a few old oil wells and barns flanking Stanley Barby’s ranch house fade quickly after a short drive down a narrow path in prairie grass tall enough to swat a pickup truck’s side mirrors. Today, the Barby Family owns an ocean of grass in Oklahoma’s Panhandle. The scrubby sandhills are the same ones that greeted Barby’s great-grandfather before statehood when he started what would become a 40,000-acre ranch in a region dubbed No Man’s Land. “I’ve heard the old-timers talk about when they came to this country, and there wasn’t any fences, and there wasn’t any trees, and there wasn’t anything how you’d just almost feel lost,” Barby said. No Man’s Land, it turns out, is also a great home for a lesser prairie chicken — a finicky bird struggling to thrive in increasingly fragile western grasslands. It’s getting harder to spot the grey and brown grouse, which is celebrated by bird nerds for the elaborate and fleeting song and dance male members of the species perform to woo mates in the spring. Lesser prairie chickens are also considered an indicator species representing the overall health of grasslands, which are increasingly fragmented and slowly vanishing. An estimated 300,000 lesser prairie chickens roamed Oklahoma, Colorado, Kansas, New Mexico and Texas in the 1970s. The most recent survey puts the total number of lesser prairie chickens at around 38,000. The federal government has several programs intended to boost lesser prairie chicken populations on a patch of increasingly profitable prairie that’s also home to crops, drilling rigs, wind turbines and electricity transmission lines, tall objects prairie chickens instinctually won’t get close to or breed near because they’re good perches for predators. A lesser prairie chicken near Roswell, N.M. The U.S. Fish and Wildlife Service is once again considering whether to use the Endangered Species Act to protect the lesser prairie chicken. The first petition to use the federal law to protect the bird was filed in 1995. Federal wildlife officials in 1998 determined the prairie chicken met the requirements for listing but opted to focus the agency’s limited resources on protecting higher priority species. The effort was rekindled in 2012 when U.S. Fish and Wildlife proposed listing the bird as a “threatened” species, which prompted pushback from state wildlife officials and business groups who worried such a designation would mean major hassles for landowners and industry. In response, Oklahoma and its four neighbors collaborated on a Range-wide Conservation Plan, a partnership through the Western Association of Fish and Wildlife Agencies designed, in part, to steer federal officials away from an endangered species listing. Under a plan designed to roughly double the prairie chicken population to 67,000 over a decade, companies voluntarily agreed to restrictions and paid fees that go to landowners who preserved habitat for the birds. In return, companies were protected if the lesser prairie chicken became a protected species in the future. “It’s basically an insurance policy,” said J.D. Strong, director of the Oklahoma Department of Wildlife Conservation. And it came in handy. The U.S. Fish and Wildlife Service in 2014 listed the lesser prairie chicken as threatened and the Permian Basin Petroleum Association, a big industry organization representing drilling interests in Texas’ prolific oil and gas region, promptly filed a lawsuit — and won, successfully stripping the bird’s federally protected status. Around the same time, oil prices plummeted. Without a looming endangered species threat, energy companies that once flocked to the voluntary insurance program bailed. 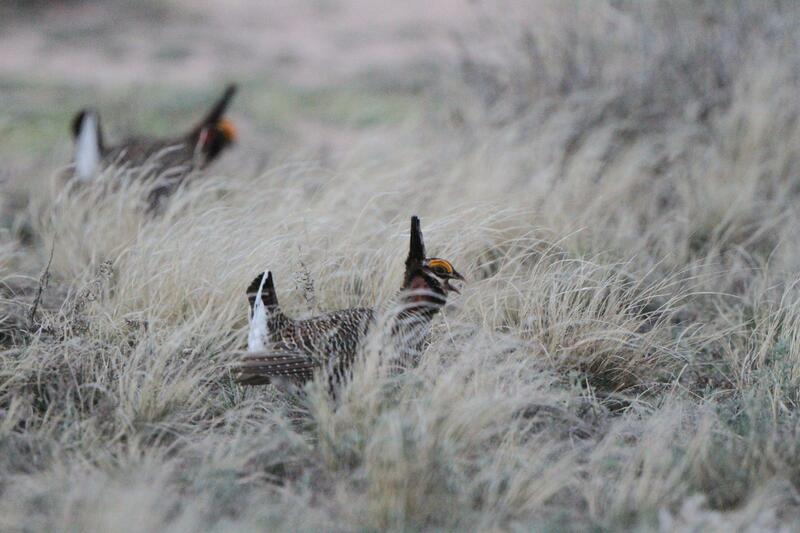 Christian Hagen, an Oregon State University professor who researches prairie chicken conservation efforts, says the bird and its habitat have shown positive signs in recent years — in particular, improving numbers after the devastating drought eased in 2013. Hagen said it’s too early to know for sure whether conservation efforts are working, or whether the Endangered Species Act listing and subsequent delisting had much of an effect. 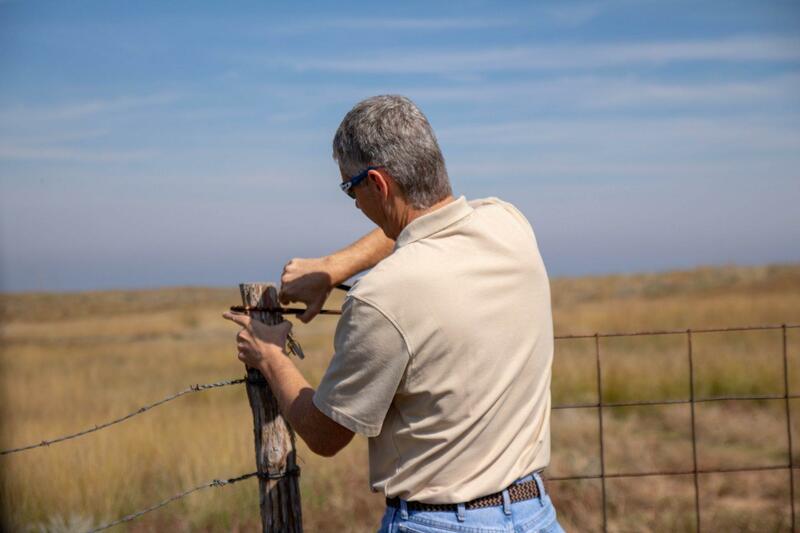 Wayne Walker of Common Ground Capital opens a fence on Stanley Barby’s ranch. Walker, the company’s founder, helps broker land to energy companies and other businesses seeking to buy conservation credits. Landowners, wildlife officials and environmental groups expected the U.S. Fish and Wildlife Service to make a ruling on the lesser prairie chicken’s endangered species status in September. It’s unclear how the agency might rule. Many of the factors that led to its threatened listing in 1994 haven’t changed much, but the process is now overseen by an administration that has moved to weaken the Endangered Species Act and the U.S. Fish and Wildlife Service has been without a permanent director since President Trump took office in 2017. Some environmental groups and landowners say the lesser prairie chicken won’t rebound and meet population restoration goals unless Oklahoma and its four neighbors make changes to the WAFWA conservation plan. A key part of the challenge is unlike some at-risk species that live on public land, the prairie chicken’s habitat is almost entirely privately owned. “The distinction is it’s a private sector model versus a government sector model,” said Wayne Walker, founder of Common Ground Capital, which brokers permanent conservation land like the Barby Ranch to companies seeking conservation credits. Walker said the WAFWA conservation plan doesn’t pay enough to lure landowners to sign permanent contracts promising their land will never be developed. A WAFWA representative did not respond to StateImpact’s interview requests. “It basically says, ‘Hey we’re going to pay X-amount per acre, take it or leave it.’ And that’s not enough money to get the best stuff,” Walker said. Stanley Barby, the Panhandle rancher, agrees. A Texas federal judge on Tuesday overturned endangered species protections for the lesser prairie chicken. U.S. District Judge Robert A. Junell ruled that the U.S. Fish and Wildlife Service didn’t properly consider a voluntary conservation plan established for Oklahoma, Texas, Colorado, Kansas and New Mexico before listing the bird as “threatened” under the Endangered Species Act. The U.S. Senate has rejected an amendment by Sen. Jerry Moran of Kansas that would have removed the lesser prairie chicken from the federal government's threatened species act. The Kansas City Star reports Moran's amendment to a bill intended to expedite construction of the Keystone XL pipeline fell short of the 60 votes needed to be added to the measure. The U.S. Fish and Wildlife Service last year designated the lesser prairie chicken as threatened, which is one step below endangered under the Endangered Species Act. In this week's Maphead, Ken Jennings explains how the Oklahoma panhandle went from unclaimed land to bootlegger's paradise—and is now a road-trip destination.